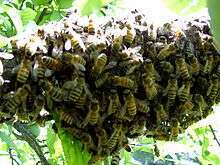 Apis mellifera ligustica is the Italian bee which is a subspecies of the western honey bee (Apis mellifera). There is no clear evidence that A. m. ligustica is more resistant to acarine mites than the Northern dark bee. They also appear to be less tolerant of Nosema than Northern dark bees. They are unable to retain faeces in the gut for long periods and require more frequent cleaning flights than the dark bees. 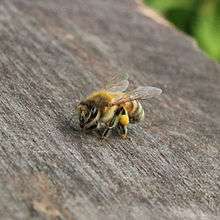 They are affected by the parasitic varroa mite, Tracheal Mites, and the bacterial diseases European Foulbrood, American Foul Brood, Chalkbrood and other diseases of the honey bee. — Brother Adam, "Breeding the Honeybee" (Northern Bee Books: Mytholmroyd, 1987), pp. 96-98. — Brother Adam, "Breeding the Honeybee" (Northern Bee Books: Mytholmroyd, 1987), pp. 97-98. 1862 introduced to Australia, on 9 December into Victoria aboard the steam ship Alhambra There is strong evidence this introduction failed as the emerging Italian virgin queens hybridised with the English 'black' bee (source: Barrett, P. "The Immigrant Bees, 1788 to 1898", Vol. IV). Wilhelm Abram brought several queens from Italy to Sydney in December 1880 but it's probable they reached New South Wales through other hands earlier on. 1884 (Easter) introduced to Kangaroo Island in South Australia, sourced from Brisbane where they were previously imported in 1880 from Italy by Chas. Fullwood. Jas. Carroll received a hive of Italian bees in Brisbane, Queensland, in 1877 when Angus Mackay accompanied a hive aboard the City of New York, packaged by Harbison in California. After a week's stopover in Sydney, the bees arrived in Brisbane. Honey from Kangaroo Island is marketed (in 2014) as being from the only pure Ligurian bees in the world. 1 2 Brother Adam, "Breeding the Honeybee" (Northern Bee Books: Mytholmroyd, 1987), pp. 96-98. ↑ "14 Aug 1914 - BEE CULTURE.". nla.gov.au. Retrieved 20 August 2015. 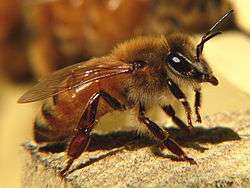 Wikimedia Commons has media related to Apis mellifera ligustica.